Democrats and health care advocates say coverage should be free for the state’s poorest residents. For the most financially destitute Mainers, the Senate debate and vote Wednesday that dimmed the prospects for Medicaid expansion was more than a political and ideological battle. It likely put health insurance out of reach for them this year. “I’m left out in the cold,” said Gail MacLean, 64, a farmer from Gray. Some opponents of expanded Medicaid – called MaineCare in Maine – have argued that low-income Mainers should instead buy their own insurance at subsidized prices offered through the Affordable Care Act. But, under the law known as Obamacare, Mainers such as MacLean who earn less than 100 percent of the federal poverty level – about $12,000 per year for a single adult – don’t qualify for those subsidies. Mainers who are slightly above the 100 percent income threshold qualify for subsidies that can drive down premiums to less than $20 per month. And additional cost-sharing subsidies are available to help them pay for deductibles and other health care costs. However, those below the poverty level are left to pay hundreds of dollars per month for insurance – often more than half of annual income. The reason: When the Affordable Care Act was passed in 2010, Medicaid expansion was mandatory and Americans like MacLean had to be covered. But a U.S. Supreme Court ruling in 2012 permitted states to opt out of the expansion, and so far Maine and about 20 other states have spurned it. While Democrats have been solidly behind expansion, a compromise plan by Republican Sens. Roger Katz and Tom Saviello failed to gain additional Republican votes Wednesday in the Senate, despite several provisions designed to attract moderates’ votes. The 22-13 vote in favor of expansion fell short of the two-thirds needed to override a certain veto by Republican Gov. Paul LePage. The expansion would add an estimated 60,000 to 70,000 Mainers to the state’s Medicaid program. Roughly half of those Mainers earn less than federal poverty level. Rep. Deb Sanderson, R-Chelsea, said adding that many Mainers to a government program would be too expensive for the state, and some may prefer subsidized private insurance through the health insurance marketplace. If MaineCare expansion doesn’t pass, she said, “maybe it will incentivize some folks” to pick up extra work and earn more money. Democrats and health care advocates argue that even the modest costs of subsidized insurance are difficult for low-income Mainers to afford, and that health care should be free for the poorest residents. Drew Joy, 33, of Portland earns close to $12,000 a year as a carpenter and independent contractor, and has been without health insurance for a decade. Joy is on the fence about buying insurance on the marketplace, because to qualify Joy would have to claim less in business expenses, and would pay more in taxes. 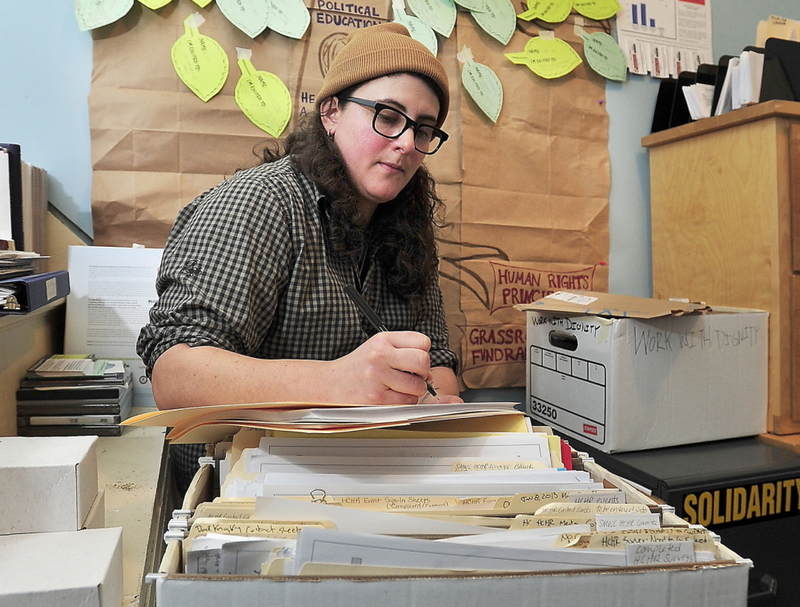 But Joy, who volunteers with the Southern Maine Workers’ Center, which advocates for MaineCare expansion, said those in the lowest income bracket shouldn’t have to do that kind of financial juggling. With an income that fluctuates from year to year, it’s difficult to know how much work will come along, Joy said. Disappointed by Wednesday’s vote, Joy plans to keep fighting for Medicaid expansion. “I think it’s really unfortunate that, given all the compromises that were being made, not enough people stepped forward and were willing to do the right thing,” Joy said. Joe Kubetz, 35, of Portland said he has been uninsured since 2012, when he was laid off from his full-time job at a greenhouse. Kubetz said he started a landscaping business in 2013 and hopes to expand it this year, but doesn’t believe he will make the $12,000 needed to qualify for the health insurance subsidies. He said he’s in good health but that could change at any time, and many low-income Mainers are not as fortunate as he is. “It’s important to take care of our fellow Mainers,” said Kubetz, who has volunteered for the Maine People’s Alliance in favor of MaineCare expansion. If MaineCare expansion fails in this legislative session, the issue is sure to loom large in the governor’s race this year. LePage is in a three-way race with Democratic U.S. Rep. Mike Michaud and independent Eliot Cutler. Michaud and Cutler favor MaineCare expansion.